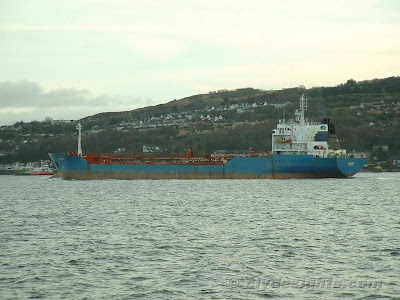 One of four sister ships seen regularly on the Clyde in years gone by, Brostom's 14,329 tonne deadweight tanker TRAPPER was built in 1985 as THUNTANK 8 by Falkenbergs Varv in Sweden for Erik Thun AB. In 1991, following a reorganisation within the company, she was renamed UNITED TRAPPER and six years later, the prefix to her name was dropped although her sisters - TRADER, TRANSPORTER and TRAVELLER - all received 'BRO' names. In 2006, following the Liberian flag as ROYAL, operated by Aegean Shipping.